It is not difficult to wash dishes although many people make it a very disagreeable process. The necessary apparatus include a plentiful supply of hot water, a good soap, ammonia or borax to soften the water, a gritty soap or powder. Have a pan for washing and another for rinsing, and a tray for draining if there is no drainer attached to the sink. Prepare the dishes by scraping and neatly piling articles of a kind together. Wash the cleanest dishes first, usually the glasses, next the cups and saucers, and the silver next. 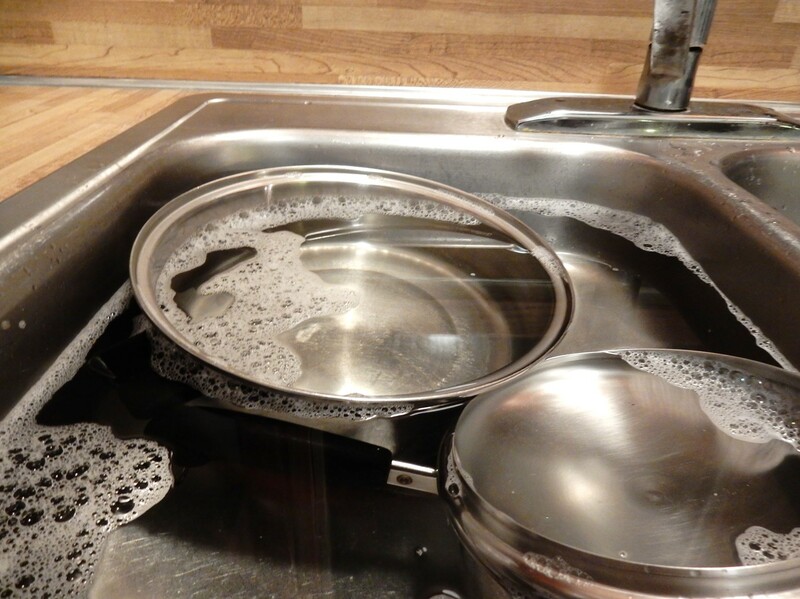 Have the soiled dishes near the pan, and put in only one or two articles at a time. To pile in a number means the nicking of china, and scratching of silver. Dip each dish in the rinsing water and then put in the drainer. Be careful not to use too hot water for delicate china and glass. Change the soapy water when it becomes in the least greasy. Use dry towels to wipe the dishes dry. Very interesting. I generally follow these guidelines! I knew I was an old-fashioned lady. I’m not very systematic about how I wash dishes–but I think that I also generally follow them. My general guiding principle is to wash the less dirty items first. Another reminder of how much things have changed! When I first read this, I was struck by the statement that when you wash dishes you need “a good soap, ammonia or borax to soften the water. . . ” I’ve never used soap to wash dishes–and never heard of adding ammonia or borax to the water. I started washing dishes when I was very young. At home and at my Dad’s restaurant. I knew those rules well. I was very happy when we got a dishwasher in both places! Wow, I can’t even imagine how many dishes you must have washed at the restaurant. I can understand why you were glad when they got dishwashers. I have the dishpan hands to prove it! What a lovely story about your grandmother. Depending upon the situation, washing dishes can be either fun or drudgery. Doing dishes was a social occasion as well as a household chore. And there were different towels for drying different objects: glassware and other delicate items required what we called tea towels. Right now, I should go practice the art in my kitchen, where a bit of yesterday is waiting to be dealt with! Your comment about how doing dishes used to be a social occasion reminded me that my mother used to say that when she was a child, the children in her family had to do the dishes. Each day one child got to be the reader. This child read a book or story aloud while the others washed and dried the dishes. This brings back the image of dishes standing in the drainer and drying. Good advice on washing dishes. It is nice to see the dishes all clean and neat but it doesn’t last long before there is another batch. So much housework is recurring. . . sigh. . .
Love this post – since I have been washing dishes since I was 10 years old. Everyone does it differently. I’m glad you like it. We probably wash dishes by hand about half of the time. If we just have a few, we hand wash them; but when there are a lot, we use the dishwasher. Even when we use the dishwasher, we often have pots and pans that we wash by hand. How little we appreciate things like detergent. At one point many years ago when our children were little, I tried to spare the environment by using soap rather than detergent to wash the dishes. It was awful. Not only was it hard to get the dishes clean, it was difficult to clean off the counters satisfactorily. I gave it up and returned to detergent. And by the way, I don’t know what my father used, but dishwashing time used to be family time when I was growing up, the youngest — by far — of three. My father washed, my mother cleared and put away, and I dried. We spent a lot of time singing as well as talking. A nice memory evoked by an earlier comment. What a lovely memory! It sounds wonderful to sing while washing and drying the dishes. I hadn’t realized until I read the description in the old book about how to wash dishes that people once used soap. I’m guessing the detergents must have been invented less than a hundred years ago. Detergents were invented during the War, since soap was rationed. Housewives found that they much preferred detergents, anyway (anybody remember the Rinso “crud”) so soap died a quick death. Thanks for the info. I learned something new. I have a vague memory that I once heard that plastics were invented during WWII, but I had no idea that detergents were something that didn’t exist until the 1940s. The idea was that fats were used in the manufacture of soap, and fats were needed for the War effort. If I recall correctly, they needed them to oil the guns. Interesting stuff, huh? I grinned on this, I wonder what ever inspired someone to write an article on dishing washing!Then I tried to remember how young I was when Mom had my brother and I do the dishes. I honestly don’t know how old I was… I do remember my brother and l had some good times doing dishes together,with a few squabbles happening. ;) and I’m still doing dishes, which I enjoy. More now than in the growing up years. I got this out of a hundred-year-old home economics textbook. The early 1900s was the era when home economics was a very popular subject for women. People believed that men should learn how to scientifically manage businesses–and that the scientific management of their homes could be equally rewarding for women. I am so spoiled with a water softener! Washing dishes by hand – a lost art? I love these instructions from the past. When the lights go out this winter and my dishwasher is useless, I will hit the suds again. Very helpful suggestions. Still rings true today. I like how it explains in a systematic way something that I kind of intuitively know. Yes, I miss the chatting time I associate with paired washing up. Lots of major conversations in my life were had to the feel of tea towels and the steam rising from drying pots and pans. How true! I love how wonderfully you describe the beauty of washing dishes. It takes me back to a warm, fuzzy place. I enjoyed the story! When I was in South Africa, I learned they do not rinse the dishes. They wash, stack on a drainboard, and then dry the soapy water and put them away. I always had to rinse when I washed, and if no one was in the kitchen, I always rewashed and rinsed my glass when it had been put away after just drying off the soapy water. We are culture-bound often, aren’t we? Yes, I guess we are. I never would have thought something like dish washing practices would vary from country to country. Somehow it just doesn’t seem right not to rinse dishes. My mom’s friends, when in their 70s and 80s, wintered on a small island in the Caribbean; they rented a small house across the street from the ocean and were mildly concerned about the safety of the water, so they always washed their dishes with Borax. I remember visiting them and how they asked my mom if she remembered the good old days of using Borax. I vaguely remember the ads on TV for 20 Mule Team Borax when I was a kid, but I don’t think that I’ve ever used borax. 20 Mule Team Borax was for the laundry, and then came Boraxo. 20 Mule Team is back (picture wise) and is definitely a cleaning/deodorizing agent in the laundry. Thanks for the info. I wonder what kind of Borax product they used back then to soften dish washing water. This is basically how I wash dishes, except I leave my pots soaking for a bit in the water while I clean up the rest of the kitchen and while still hot I fill with hot soapy water for easy clean up. Mom used borax too for clothes too if I remember correctly. I still see it on shelves, maybe I should try some. I never paid any attention to whether they sell borax at the supermarket where I shop. Now I’m curious. If they do, I might have to try it, too. Because of he drought in California, we have reverted to washing dishes in a bucket and using the gray water for plants in the garden. So we have reverted to back 100 years with doing what comes naturally! I washed and dried dishes a lot when I was younger. It was always a family activity. I think my formal dish washing training came from Brownies. They taught us the rules! Interesting. . . I don’t think that I ever formally learned the “rules” for dish washing. It’s interesting to see the rules all written down like this–it seems odd at first but then I can understand how some of this wouldn’t be common sense to the uninitiated. Like others, I learned dishwashing in my grandmother’s kitchen so reading your post brought back nice memories! I’m glad this post brought back some nice memories. A hundred years ago there was a push for women to “scientifically manage” their homes–and my sense is that home economists tried to develop processes and procedures that would help women do it better. Almost exactly the way I learned to wash dishes, except we never added ammonia or Borax. We never added ammonia or Borax either–but we did have a water softener so maybe it wasn’t needed. There is an art and a science to washing dishes. Thank you for this gentle reminder. I never thought about it quite this way, but you may be right. Home economists definitely were trying to “scientifically” describe how to do various household tasks in the early 1900s. Is putting dishes, glasses, and silverware into the dishwater in no specific order an art? If so, that may be how I wash dishes. I generally try to wash the “cleanest” items first–but which specific items I wash first varies from one meal to the next. I see putting dishes in the dishwasher like a jigsaw puzzle — I try to maximize my utilization of the space. I also wash dishes with soap and borax acid and soak the cutlery in soapy water so that they are easier to clean. I want my dishes clean, but I also want to conserve water. What can I say? I take washing dishes very seriously! I like the jigsaw puzzle analogy. I always seem to have just two or three more dishes than what easily fit into my dishwasher. I also wanted to add that I use ammonia too, but not together with the borax. Ammonia is good for cutting grease and I believe extends the soap’s cleaning ability. It took me a while to figure out a good routine for doing dishes. I think I would have benefited from such an article earlier. Interesting. . . I never would have thought about adding ammonia to my dishwater until I read the old article and then your comment.